Banksia ericifolia L.F is a large shrub of 3-6 m tall. The leaves are small, narrow linear dark, 9-20 mm long and 1 mm wide, two small teeth at the tips, crowded leaves, alternately arranged on the branches. Smooth grey-coloured bark with thin lenticels, thickened with age. Long orange or yellow candle-like flowers appear from April to September, spikes 7-22 cm tall and 5 cm wide; hooked styles projecting from the axis of the flower spike. Old flower spikes fade to brown and grey with age. Seeds retained in woody follicle, cones. Banksia ericifolia is native in Australia and invasive in the United Kingdom and Hawaiian islands. 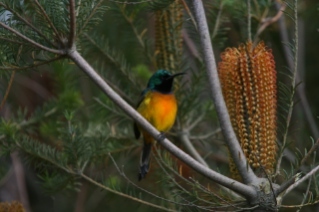 Heath-leaved banksia was introduced in South Africa as a horticultural plant. One population has been recorded as invasive at Agulhas National Park and another record exists for the Honingklip Farm at Kleinmond. 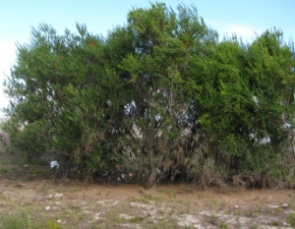 Heath-leaved banksia is drought tolerant once established in a habitat. Its potential distribution covers most fynbos areas in the Western Cape and has the potential to be highly invasive in fynbos. 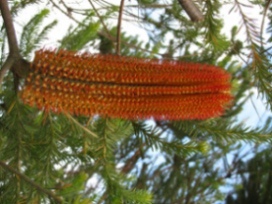 Heath-leaved banksia outcompetes natural vegetation and is capable of forming mono-specific stands under specific fire regimes, attaining twice the height of indigenous proteoids. Heath-leaved banksia is spread by wind through seed dispersal. Seeds from old cones are released occasionally but seed release normally occurs in response to environmental triggers. Most seeds are released after fire. Plants resprout after cutting. Heath-leaved banksia is currently controlled by uprooting seedlings and cutting plants at ground level. There are no herbicides registered for this species in South Africa.